The Geography of Oklahoma encompasses terrain and ecosystems ranging from arid plains to subtropical forests and mountains. Oklahoma contains 10 distinct ecological regions, more per square mile than in any other state by a wide margin. It is situated in the Great Plains and U.S. Interior Highlands region near the geographical center of the 48 contiguous states. Usually considered part of the South Central United States, Oklahoma is bounded on the east by Arkansas and Missouri, on the north by Kansas, on the northwest by Colorado, on the far west by New Mexico, and on the south and near-west by Texas. 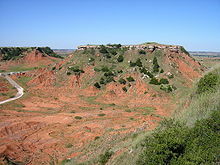 A portion of the Flint Hills stretches into north-central Oklahoma, and in the state's southeastern corner, Cavanal Hill is officially regarded as the world's tallest hill; at 1,999 feet (609 m), it fails the definition of a mountain by one foot. More than 500 named creeks and rivers make up Oklahoma's waterways, and with 200 lakes created by dams, it holds the highest number of reservoirs in the nation. Oklahoma covers an area of 69,898 square miles (181,030 km2), with 68,667 square miles (177,850 km2) of land and 1,231 square miles (3,190 km2) of water, making it the 20th-largest state in the United States. Generally, it is divided into seven geographical regions: Green Country, or Northeast Oklahoma, Southeastern Oklahoma, Central Oklahoma, South Central Oklahoma, Southwest Oklahoma, Northwest Oklahoma, and the Oklahoma Panhandle. The Ouachita Mountains cover much of southeastern Oklahoma. Populations of American bison inhabit the state's prairie ecosystems. Mesas rise above Oklahoma's Glass Mountain state park. Oklahoma map of Köppen climate classification. Hickory, pine, and oak forests dominate Northeastern Oklahoma, which receives far more rain than western areas of the state. Oklahoma sits at a frequent crossroads between three different air masses: warm, humid air from the Gulf of Mexico; warm to hot, dry air from Mexico and the Southwestern U.S.; and cold, dry air from Canada. Especially from fall to spring, Oklahoma sees frequent air mass changes, which can produce drastic swings in both temperature and humidity. Much of the state is often subjected to extremes in temperature, wind, drought, and rainfall. Most of the state lies in an area known as Tornado Alley characterized by frequent interaction between cold and warm air masses, producing severe weather, with the highest-risk months from April to June. An average of 62 tornadoes strike the state per year, making that one of the highest rates in the world. Due to its position between zones of differing prevailing temperature and winds, weather patterns within the state can vary widely between relatively short distances. Precipitation occurs year-round, but average monthly precipitation is generally lowest in the winter months, rises dramatically to a peak in May (the year's wettest month virtually statewide, owing to frequent, and not uncommonly severe, thunderstorm activity), and decreases again by mid-summer, when long stretches of hot, dry weather are common in July and August many years. Early to mid fall (September and October) often sees a secondary precipitation maximum. From late October to December, precipitation generally decreases again. Eastern Oklahoma has a humid subtropical climate ( Köppen Cfa) heavily influenced by southerly winds bringing moisture from the Gulf of Mexico and has hot, humid summers and generally mild winters, but with sometimes-dramatic cold spells, sometimes accompanied by snow, sleet or freezing rain. This transitions progressively to a semi-arid zone (Köppen BSk) in the high plains of the Panhandle, where a drier climate prevails, with somewhat-colder winters and similarly-hot summers but much lower humidity. Other central to western areas of the state, including Lawton and Enid in the transition zone, are also less affected by moisture from the Gulf of Mexico. They also tend to be drier than Oklahoma's eastern counties. Precipitation and temperatures fall from east to west accordingly, with areas in the southeast averaging an annual temperature of 62 °F (17 °C) and an annual rainfall of over 40 and as high as 56 inches (1,420 mm), while areas of the panhandle average 58 °F (14 °C), with an annual rainfall under 17 inches (430 mm). All of the state frequently experiences temperatures above 100 °F (38 °C), or below 0 °F (−18 °C) (though subzero temperatures are rare in southeastern Oklahoma),  and snowfall ranges from an average of less than 4 inches (10 cm) in the far south to just over 20 inches (51 cm) on the border of Colorado in the panhandle. The state is home to the National Storm Prediction Center of the National Weather Service located in Norman. Winter and spring weather often are influenced by the El Niño Southern Oscillation. Winters during El Niño are cooler than average and wetter across the western portion of the state due to an amplified southern jet stream. During La Niña, the storm track is further north, therefore winters are warmer than average and drier in the western part of the state. ^ "Oklahoma, All Terrain Vacation". TravelOK. TravelOK.com. 2006-01-12. Archived from the original on July 9, 2006. Retrieved 2006-07-15. ^ a b "The Geography of Oklahoma". Netstate. 2007-07-31. Retrieved 2007-07-31. ^ "Managing Upland Forests of the Midsouth". USDA Forest Service. 2007-03-07. Archived from the original on 2008-06-22. Retrieved 2007-07-31. ^ a b c d "About Oklahoma". TravelOK.com. 2007. Retrieved 2006-07-10. ^ "Land and Water Area of States, 2000". Information Please. 2000. Retrieved 2006-11-22. ^ "A Tapestry of Time and Terrain". USGS. 2003-04-17. Archived from the original on 2006-05-15. Retrieved 2007-07-31. ^ a b "Oklahoma State Map Collection". geology.com. 2006. Retrieved 2007-08-01. ^ a b c d e Arndt, Derek (2003-01-01). "The Climate of Oklahoma". Oklahoma Climatological Survey. Retrieved 2007-07-31. ^ a b c "Oklahoma in Brief" (pdf). State of Oklahoma. 2003. Retrieved 2007-08-04. ^ a b c "A Look at Oklahoma: A Student's Guide" (PDF). State of Oklahoma. 2005. Archived from the original (pdf) on December 30, 2006. Retrieved 2007-08-14. ^ a b "Oklahoma Ecoregional Maps". Oklahoma Department of Agriculture. Archived from the original on 2007-10-13. Retrieved 2007-08-02. ^ "National Forests". United States Department of Agriculture Forest Service. 2005-05-01. Retrieved 2007-08-02. ^ "Ouachita National Forest". United States Department of Agriculture Forest Service. 2005-05-10. Retrieved 2007-08-02. ^ "Tallgrass Prairie Preserve". The Nature Conservatory. 2007. Retrieved 2007-07-31. ^ "Black Kettle National Grassland". USDA Forest Service. 2007-07-24. Retrieved 2007-08-02. ^ "Refuge Locator Map - Oklahoma". U.S. Fish and Wildlife Service. Retrieved 2007-08-17. ^ "Wichita Mountains Wildlife Refuge". U.S. Fish and Wildlife Service. Retrieved 2007-08-17. ^ "Chickasaw National Recreation Area". Oklahoma Wildlife Department. Retrieved 2007-08-02. ^ "Oklahoma National Park Guide". National Park Service. 2007. Retrieved 2007-08-02. ^ a b c "Oklahoma's Climate: an Overview" (pdf). University of Oklahoma. Retrieved 2007-08-01. ^ "Tornado Climatology". NOAA National Climatic Data Center. Retrieved 2006-10-24. ^ Novy, Chris. "SPC and its Products". NOAA. Retrieved 2007-08-01.